Yesterday, David Klinghoffer, a fellow at the creationist “think tank” the Discovery Institute and the author of the absurdly titled book How Would God Vote? : Why the Bible Commands You to Be a Conservative, forcefully demonstrated the ways in which he and the Discovery Institute engage in blatant intellectual dishonesty. Shortly after Zack Kopplin routed Klinghoffer’s colleague Casey Luskin on a national radio show, Klinghoffer took to the Discovery Institute’s website and published an article titled “Zack Kopplin Thinks Louisianans Are Stupid,” an argument he based, entirely, by lifting and grossly mischaracterizing a single sentence from a story Zack told about his experience as a thirteen-year-old kid at summer camp in Connecticut. For those familiar with the tactics of the Discovery Institute, it’s probably unsurprising that Klinghoffer “quote-mined” from Zack’s speech in order to advance a lie. After all, manipulating other people’s words is one of the Discovery Institute’s hallmarks. Still, this seemed different: Klinghoffer wasn’t simply cherry-picking a couple of sentences from an academic journal to criticize evolution; he was distorting a personal story about being a thirteen-year-old at summer camp to level a spurious and, in my opinion, defamatory personal attack, all in attempt to discredit Zack’s character, not his arguments. And of course, it is laughable and pathetic and obviously mean-spirited. The real issue, however, is not David Klinghoffer’s dishonesty; it’s that David Klinghoffer published his attack under the masthead of a tax-exempt, tax-deductible organization. And it got me thinking: What, exactly, is the Discovery Institute? Why are they tax-exempt? Why does the United States allow them to operate as a charitable organization? And when people donate to the Discovery Institute, what, exactly, are they getting in return, aside from a tax deduction? After pouring over and analyzing the Discovery Institute’s most recent 990 returns and exhaustively researching their programmatic work, I think it’s abundantly obvious: The Discovery Institute is a con-profit scam. Indeed, there’s actually ample reason to believe that the Discovery Institute’s programmatic money is dramatically inflated, because during the last several years, nearly half of the expenditures they’ve itemized as “grants” has been given to the Biologic Institute, which is, essentially, a subsidiary organization. And if you delve into the 990 returns of Biologic, you’ll find that, like the Discovery Institute, it spends all of its money on salaries and overhead costs. It’s a not-so-subtle sleight of hand: The Discovery Institute entirely funds Biologic, down to the very last penny. In so doing, the Discovery Institute gets to list their expense as a “grant,” helping it to fulfill its mission as a non-profit and allowing it the ability to claim that it funds “scientific research,” and hoping that no one is the wiser, Biologic then spends the money (between $300,000 – $400,000 a year) to pay three other employees. If you combine the money the Discovery Institute provides to Biologic and the money it gives to so-called “fellows,” you’ll quickly realize: This is all an elaborate shell game; it’s a coy way of preventing the Discovery Institute from fully disclosing its activities. And perhaps more importantly, it provides the Discovery Institute with the ability to claim to the public and to its donors that it is funding “scientific research” on intelligent design. If you scratch beneath the surface, however, you find that the Discovery Institute isn’t really funding scientific research (which requires real money); they’re funding salaries. For what it’s worth, I anticipate the folks at the Discovery Institute would vehemently dispute my math and my characterization of their activities. First, I imagine they’d assert that they’re a “think tank,” and that, by the very definition of the term, they pay people to think. While I acknowledge they may self-identify as a “think tank,” it’s pretty hard to avoid the fact that they’re not spending any money on conducting scientific research, which is, ostensibly, what they claim to be thinking about. Scientific research requires real, substantial money for equipment and technology; it’s abundantly obvious that the Discovery Institute isn’t investing in research. Aside from the $831,554 in expenses they report for “developing” a transportation system between Washington, Oregon, and Canada (which seems ridiculous and well outside of their scope), they list nearly $3.5M for the “production of public service reports, legislative testimony, articles, public conferences and debates.” It’s, essentially, a job description, a way of summing up how they spent all of that money on salaries; it’s not programming, and it definitely has nothing to do with scientific research. But, for the sake of argument, let’s say that this is programming, because, if it is, then it sounds like much of their programming is on lobbying state legislatures. That’s probably not surprising to anyone who has followed the Discovery Institute. After all, just last month, Joshua Youngkin of the Discovery Institute flew all the way down to Baton Rouge to lobby against the repeal of the Louisiana Science Education Act. And while these numbers conform to guidelines on 501c(3) lobbying activities, they seem particularly suspicious, considering that earlier in the report, the Discovery Institute listed more than $3.5M in activities that appear to be awfully close to the definition of lobbying. What, exactly, is the Discovery Institute lobbying for? Well, as it should be clear, they’re lobbying to keep the gravy train on track. As long as they have politicians willing to pander to creationists, they can maintain the charade, pretending as if they’re conducting “scientific research” while raking in millions in tax-deductible donations to pay for their salaries (including at least five employees who make six figures a year). And if they’re successful in convincing legislatures, like Louisiana’s, in passing laws that allow for the teaching of intelligent design, they stand to gain even more, because, not coincidentally, the very people who are paid by the Discovery Institute are also the authors of the textbooks and supplementary materials that would be purchased, in bulk. They’re not selling an idea; they’re selling a product. One of these days they’ll learn, don’t mess with Mr. Kopplin if you have skeletons on your front porch. I love that you have his back. And Louisiana’s. Good work! “…all in attempt to discredit Zack’s character, not his arguments”. These people practically debate themselves when they do that. They make shallow comments that only shallow people don’t see through and think less of them for it. Ignorant supporters will always exist. I’m gonna bite my tongue so as to keep discussion on the group at hand, but I will say that these types of instances need increased scrutiny by the IRS across the entire political spectrum. It’s political money laundering, and it needs to stop. Love the content of the blog…Really wish I could read it. PLEASE change your font styling. Thanks. What browser and OS are you using? Ditto! This is really hard on the eyes. I’m using a PC with Windoze 7, Firefox. Thanks for the heads-up. I think it’s a bug with WordPress, and I’m working on fixing the issue. Please also note: The screen captures of the 990 reports are images, not text, and that you’ll need to click them in order to zoom in. Thanks 🙂 I’ve been working on the template. Apparently, it’s only an issue for Windows users. Please let me know if the new fonts are more readable. You can report them to the IRS (Form 3949-A) and Association of Certified Fraud Examiners (www.acfe.com). It’d be interesting to hear what happens next. This needs to be done – and i hope that it already has been. Personally, i couldn’t care less about wether they may have a religious agenda or not, and it seems that these people are merely scammers that have identified something that people feel strongly about and therefore are willing to spend a great deal of money on. You seem to be missing the point. If they want to spend their money on something other than research, great. But they are claiming to do research in order to not pay taxes. It’s like claiming to be a charity and keeping the money for yourself. Maybe they could spend some of the money in giving you a basic education in English grammar. No one ever said (nor implied) that all scientific research is 100% legitimate. Does that make the Discovery Institute exempt? And if you actually KNOW that a scientific research group is not legit, have you reported it? If you haven’t, submit it here. Really! I find it more offensive than you do when so-called scientists commit fraud. If you do not actually know of any fraudulent groups (scientific or otherwise) then don’t make such a claim. BTW, statistics show, scientists are the intellectual elite almost by the definition. Unless you want to change the meaning of the words. In fact, there is a very high IQ discrepancy between believers and atheists/agnostics. That is because atheists by nature do not claim to ‘know’ things before challenged by scientific principals. Intelligent design is a hypothesis not a theory and I think you would be very enlightened by researching the difference. Intelligent design is a politically correct bs way of keeping our belief in god in public places such as government and schools. So dont assume like u do with your “science”. Do you think anyone on the “right wing” does everything “legit” 100% of the time? Believer… Intelligent design is a hypothesis meant be oppose the theory of evolution. Problem is, the scientific facts do not support the hypothesis. If evolution is fact, which over 95% of physical scientists now believe then there is no credibility to the Genesis creation myth. This is why theists (at least Christian ones) have been forced to produce the creation hypothesis. Unfortunately, it is not scientific. It presumes the answer even before any evidence has been collected. A scientific theory is a well-substantiated explanation of some aspect of the natural world, based on a body of knowledge that has been repeatedly confirmed through observation and experiment.Scientists create scientific theories from hypotheses that have been corroborated through the scientific method, then gather evidence to test their accuracy. Modern theories have repeatedly been verified,tested, challenged and continue to go through rigorous testing. Science, has created airplanes, x-ray machines, antibiotics and vaccines, space ships, even the fabrics and dies in the clothes you wear. Religion has toppled the world trade center buildings, started the crusades, and violated some of the most fundamental human rights. Believer, you have every right to believe in a god, any god you choose but do not presume to understand science nor equate the validity of modern scientific theories with your predisposed notions of superstitious belief. Are you familiar with the Gilgamesh flood story, the parallels of Jesus and the Egyptian god Horus,or even the first council of Nicaea? Scientists and atheists like myself express concern about your belief set not only because it is untenable but also because you are inundated – perhaps even brainwashed instead of being given the whole story. My advice, speak less, learn more. Knowledge is the difference between faith and ignorance. I will now take my own advice and go on to continue my own learning. Are they sponsoring the preparation of textbooks/teaching materials and sharing in the royalties? If so, that’s a clear violation. Do they derive monetary benefit from grant recipients? What exactly are they used for? Avoid payroll taxes? Help employees avoid taxes by calling it a grant? At what point do the actions of the grant make the structure illegal? I don’t understand how all that works. I’m intrigued, though. Hey, I’m unemployed, give me grant! I’ll read the bible and say, “look it says it right here”. The legislative reports do not constitute lobbying. They can’t just start issuing scorecards in an election year, though. Anyway, from what I’ve learned today… IF, they 1.) don’t sponsor and profit from textbooks, 2.) issue grants to valid recipients for valid research, and 3.) issue unbiased legislative reports with that 3.5 and still fall within the legal lobbying limit, then it seems like they are ok. I am somehow doubting that’s the case. Believer, yes that is science. Honestly, I am confused by your point. Are you suggesting it is not accurate? Do you have some contrary information? By the way, that is a scientific measurement not the scientific method. That said, as it happens, radiocarbon dating is used for measuring the age of young objects (in geological terms that is) up to around 60,000 years. Many other techniques are used to corroborate the results such as dendrochronology and many, MANY, others. It is in the consistent findings from dozens of different dating techniques that not only tells us the technique is accurate but so are the results. If you measure the age of an object using ten completely independent techniques and get roughly the same results then you should be able to say with confidence that they are fairly accurate. Every biologist, physicist, or scientist for that matter, accepts that the results are not 100% accurate but for creationism to be even remotely close to plausible JUST in terms of time frame, then scientific results from thousands of fields would have to off by factors of hundreds of thousands. It would be like estimating the distance to the moon as less than 1 kilometer! You can criticize science all you want but you’d have to be stupid to think that millions of scientists from across numerous fields, in thousands of different countries, using a multitude of different techniques, developing their research for decades could be so completely wrong as to think the moon is only a KM away. Tony first thank you for not attacking me like im some uneducated fool! Second consistancy is coming up with the same number everytime, not “close” numbers! Second place is not almost winning, second place is the first loser lol…. Believer, attacking you as a person is never a productive pursuit and as I have said to theists before, I can respect you I just do not respect your beliefs. In fact, I think that point is critically important for all of us to appreciate. I agree that consistency is critically important but I will point out that radiocarbon dating is extremely consistent. Were you suggesting it is not? As for accurate, that could be debated as radiocarbon datings are often based on a range like plus or minus a hundred years. In terms of absolute certainty, radiocarbon dating is not absolute but since it is highly consistent not only with itself but also with dozens of other techniques it makes it absolutely clear that the approximate dates are correct. This means we can say with honest and clear minded conviction that the earth is ‘old’. By the way, your counter point to SRSLYDUDE, ‘Has anything exploded out nothing lately?’; science has shown that it is happening all the time. In fact Stephen Hawkins is famous for his discovery of Hawkins radiation which is essentially particles and anti-particles forming ‘out of nothing’ and being separated by the intense gravity at the event horizon of a black hold. Quantum physicists have in fact observed particle anti-particle formation occurring essentially everywhere including millions of times in the space of your own body. It is simply that in normal environments these particles and anti-particles are drawn back together and annihilate leaving nothing in their place. So in fact, we have seen something from nothing. This of course is not on the scale of the big bang but it does prove that it is at least feasible. As for shoving science down everyone’s throat I can agree with the sentiment however their is a big difference between verifiable facts and theist belief. That is to say that our educational system is based on what you can demonstrate as ‘truth’. Science can demonstrate it validity and does so consistently. Religious belief does not. You don’t have to agree with that but you do have to accept it. People far smarter than both of us spend their lifetimes validating the evidence. As was once said, belief doesn’t change the facts, facts however should change your beliefs. The simple truth is this, and statistics show it; if you or I or anyone else gets a higher education and actually learns what science has demonstrated, students consistently acknowledge science as truth. I cannot make you believe what I am saying no matter how hard I try but I think you will find it enlightening to actually seek more knowledge in the myriad texts available on science. If you choose not to accept science, you really should stop using airplanes, anti-biotics, x-ray machines, televisions, prescription glasses, computers, etc. All of these inventions demonstrate the consistent accuracy and validity of science. Theism has invented nothing and created little more than art, culture, war, murder, and cultural division. Hey Believer, would it be okay with you if public schools in the USA were to teach, in science classes, that Vishnu is the intelligent designer? How about allah, or Zeus? Would it be okay with you if plaques or sculptures were installed, in public buildings and at public expense, that refer to and honor Vishnu, allah, or Zeus? If a nationwide chain of Nuwaubian Nation churches were started or already in place, would it okay with you if they get the same tax breaks and other perks that christian churches/organizations get? If a ‘think tank’ lobby for Nuwaubianism, islam, satan worship, Greek gods, Roman gods, Viking gods, Indian gods, etc., were doing exactly the same things to promote their agenda and influence public policy that the discotute is doing to promote their christian dominionist agenda, would it be okay with you that they get the tax breaks and other perks of a non-profit, charitable organization? Keep in mind that freedom of religion does not mean freedom of ‘christianity’ only, and it also doesn’t mean that christians or anyone else can shove their religion into everyone else’s life whether they like it or not. And nethier is shoving “science” down someone else’s throat when they dont believe in it ethier! The difference is that science is true whether you believe it or not. You are NOT the Road Runner and can ignore gravity because you never studied law. Wow … I’m in BC, Canada … Waiting in anticipation for the scientifically researched, creationist transportation system that they are think-tanking about, to connect me with Oregon and Washington. Informative and substantive. I do wish that the subjects of miseducation, religiosity, money schemes, and their fleeced relations had more national recognition. This blog helps that cause and so I applaud you. I think that it’s fair to say that ‘creationist “think tank”’ is an oxymoron. Thank you, Lamar, for writing and posting your article about the discotute. I keep wondering why this hasn’t been brought to the attention of the IRS? They claim they’re a tax-deductible organization, yet as you point out it’s all a shell game with them, and they’re basically a religious organization to boot. Transportation? They don’t do diddly squat with that or anything else. 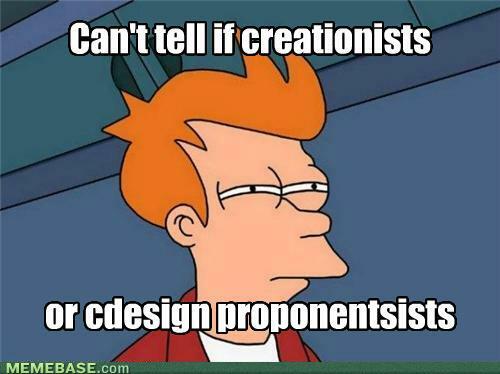 All they do is lobby state legislatures to implement creationism. Really, the DI started with transportation issues in the NW US and SW Canada. In 1992 or so, they formed the Cascadia Center. The Bioloigic Institute and the Center for Cultural Renewal (or whatever they are calling it these days) were created later. But, just like ID itself, the DI is nothing but a shell game. so much attempt you set to make this kind of wonderful informative website. It’s ‘poring’, as in reading closely, not ‘pouring’ as in liquid flowing.